It has cause quite the furor and everyone has been talking about it, including a page on Facebook I read called, Huffington Post Parents. “Throwing juice and snacks at them and, if that doesn’t work, we go home and I pour a Gin”. 7 people found my comment funny. They have a sense of humour and are probably parents like you or I, fully aware of the daily struggles you face when you have kids. 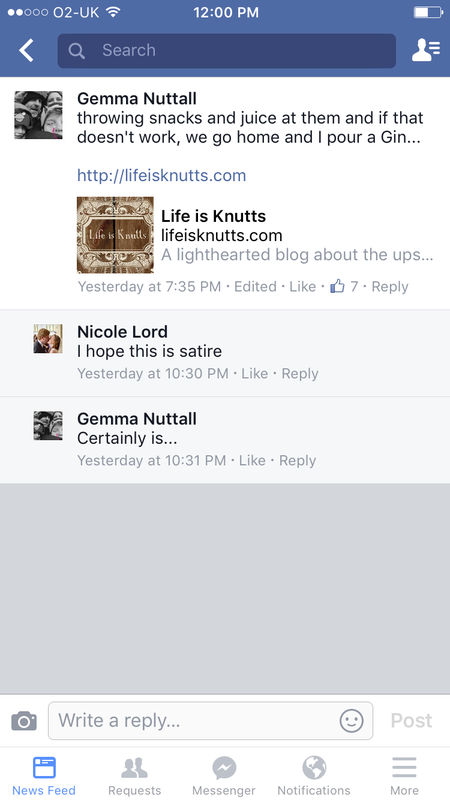 Little does the woman in question know (who’s name I’m not removing because she is brave enough to want to start a debate on Facebook) my reply of “certainly is….” Was also satire. I’ll be honest with you all. I do offer snacks and juice to my toddler in the midst of a public outburst, jeez, I’m sure I’ve even offered to take him to Peppa Pig world in a helicopter before now if he will just calm the chuff down! There is truly not much worse than having to deal with the stares and glances you inevitably get when out and about and your toddler has decided to have the mother of all meltdowns (possibly because he’s decided he doesn’t like wearing clothes in public anymore and wants to be naked in the middle of Morrisons (yes, this has happened…)). You want nothing more than for the tantrum to finish. To calm them down. To look like you’re a good mum who is in control. 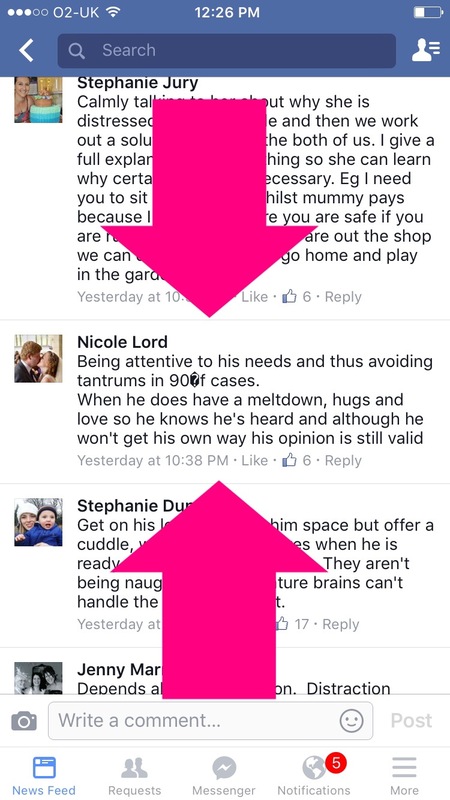 But the fact of the matter is, there is no reasoning or rationalising with a toddler in the midst of a tantrum. It’s happening and there’s nothing you can do about it (like that scene in the movie Bridesmaids where she has an upset tummy and poops in her wedding dress fitting in the middle of the street… “It’s happening” – yes Hun, it is. And there’s chuff all you can do about it). I don’t mind that this lady has an opinion different to mine, we are all allowed a say, but i do mind the fact she felt like she could kick off at me about it because I know full well if I’d replied with “of course it’s not satire, i genuinely do throw snacks and juice at him and later in the day, I will probably have a little Gin and Tonic” she would’ve let rip at me. Avoids tantrums 90% of the time. This woman is better than super nanny and made me feel like I’m utterly useless. After taking this photo (important for blogging purposes) I scooped him up and gave him a cuddle. I told him calmly I knew he was sad his friend had to go but that we could go and watch the trains on the bridge instead. This little chat and cuddle attempt ended with him slapping me hard around the face and pulling my hair. So, in conclusion, there is nothing that helps with a tantrum. You’ve just got to ride it out. If they’re being noisy and you can escape the situation and try to calm them in a private place then fab but if you can’t, don’t stress. It’s all normal behaviour (as annoying as it is) and their little brains are still developing and learning to cope with the world (much like Donald Trumps…how is this man doing so well?!?! Scary shizzle people, he’s going to be leader of the free world before we know it… ). So, thanks for your comment Nicole but I’ll stick to my style of parenting thanks. And you to yours. And that’s fine. Just don’t try and belittle others because they don’t conform to your ideas. Oh thank god it isn’t just my children that try and get naked in protest whilst out and about!!!! I had a very embarrassing incident in a post office once, I had been in a queue for an hour and nothing was doing to make me leave my space until my middle child screamed I need a poo NOW and when I turned around she was naked from the waist down!!!!! my package could definitely wait!!!!! I don’t think hers could!!!! Snacks and bribery all the way!!!!!! Hahaha, I’m not sure this woman actually has a child, maybe she has a robot? Little kids having tantrums is just a fact of life – if you got lucky and landed one who doesn’t tantrum much, good on you, but no matter how attentive you are to your child, they’re going to happen. 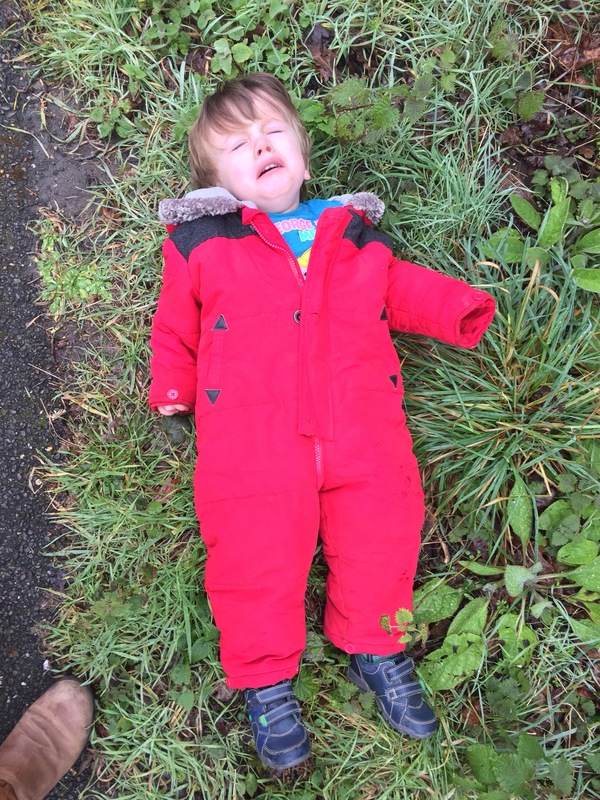 And the thought of trying to give my boy a cuddle in the middle of a tantrum is hilarious and baffling – that would just wind him up even more – like you said, you’ve just gotta ride it out. Phew! Thanks Katie, I was beginning to doubt myself (how silly of me!) but you’ve made me feel better now! At least you can pick a toddler up and tuck them under your arm and remove them from the shop, you all wait till your 2 year old becomes a teenager…..
You might have to wait a long time, but when your son grows up and has kids of his own, there’s nothing quite like watching him dealing with their temper tantrums. Thank you universe! I also still laugh every time I walk past the revision books in W H Smiths – over to you son, and good luck! You are indeed a very talented writer, you made me laugh! About our discussion on your imminent trip to the Greek Islands I’d suggest you escape – just call it a parental sabatical. There is no right way to parent or we would have given that manual to all 12 year olds. Distraction works best for me – did you hear that fire engine? look at that baby she’s scared of you? … you get the drift. But writing and humour are a gift that you have in abundance so keep it up please? Indeed…I’m pretty sure more screaming would ensue! !